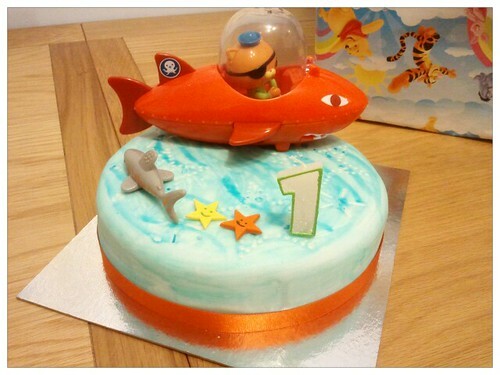 Here are some ideas for making Octonauts birthday cakes. This is a very easy cake to make. One that anyone with limited cake decorating skills can do. The secret? Fondant icing. You can buy this ready made online. Just buy the white one and add coloring. You can also make fondant at home if you have the time. You just need the Gup B and you’re good to go. You can make the cake any way you like. Prop a Gup and some sea creature figures on the top, and you’re good to go. This one may look a bit complicated at first glance, but it really isn’t. What it is though is time consuming. 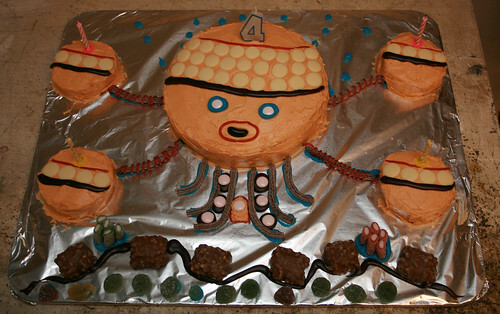 You need to make one cake for the main Octopod and four smaller cakes for the pods. Then you need to make lots of orange icing to cover all the pods. As for the rest of the fancy stuff to make it look like the Octopod, I suggest you go to your nearest candy shop and find some sweets that you can use to decorate the cake with. 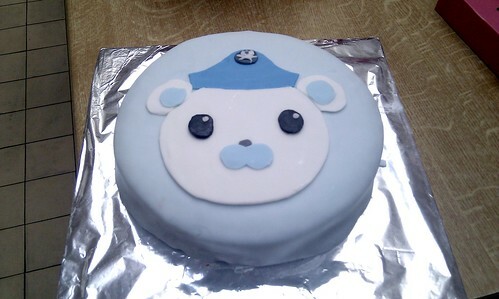 Ready to make one of your very own Octonauts birthday cake creation? Great!! Don’t forget to send us a pix so we can post it here. Here’s the surprise present which Tweak gave to Captain Barnacles during the Great Christmas rescue. A gup like no other. The Octonauts Gup X shoot and Rescue vehicle toy is much bigger than the other gups for sale (obviously!). It is three different toys in 1 and is so far, the only Gup toy that is battery-powered. This was what my son said when I asked him about the Gup X and this toy has cleverly made the Gup X toy have all these extra special features that make the Gup X what its. It can be cut in half.. Cool huh? What are you waiting for? Many parents have been very busy making Octonauts costumes for their little ones as there are no official costumes available yet. I doubt they are going to be available anytime soon. We have our very own tutorial on this site on easy ways to make Octonauts costumes if you want to follow along. This currently includes tutorials on Captain Barnacles Costume, Kwazii costume and a Peso Costume. You can also find some inspiration from the costumes below made by parents a lot more creative than I am. Check out this Kwazii Cat costume complete with an eye patch and spots. OneMommy made this for his son’s halloween costume last year. How cute is that? There’s even a pic of Kwazii carrying a Jack-o-lantern.. I’m sure many other kids were thrilled to see Kwazii in the neighborhood! Kathryn from A Mindful Life made this kwazii costume for her lovely daughter for Halloween. She wasn’t too comfortable with a proper eye patch so Kathryn improvised with this one. This Captain Barnacles costume was sent to our Undersea Heroes facebook page. Karen Bishop made this elaborate costume for his son’s Halloween costume. I wonder how long it took her to make this! So lovely. And here ladies and gentlemen is half of the Octonauts crew. What a super mom making all these for the whole family. Rookie To Rock Star Blogger Becky Nicholas made this Octonauts costumes for Halloween. Here we have Captain Barnacles, Kwazii, Peso and Dashi costumes for inspiration! If you have any pictures of any Octonauts costume, do send it so I can post it here as well for other parents to see! For the past year, I have seen Octonauts costume sold on Ebay – these are not official costumes but some of them are pretty good. With Halloween coming in a couple of months, more and more of you guys are asking where to buy Octonauts costumes this year. As far as I know, they will not be released this year! So I guess we will all have to make do with making our own costume or finding them on Ebay. With a little bit of help from the comments section on the site and a little bit of research, I’ve come up with some ideas on how to make your own Octonauts costume at home. Hope this helps some of parents. If you have any other ideas that I have not mentioned here, please don’t hesitate to make comments below. Again, if you have any pictures of your little ones in these cute Octonauts costume, please do send them so I can post them on this site. So far, I’ve only written costume ideas for the three main characters: Captain Barnacles, Kwazii Cat and Peso Penguin. I’ll try to find ideas for costumes for the rest of the Octonauts soon. Please click the links below for instructions on how to make these costumes. The Peso costume is one of the easiest to avail of right now because there are a lot of Penguin costumes that you can easily buy. Below is a Penguin costume that you can easily customize to look like Peso. The greatest challenge you’ll have with this costume is getting rid of the beak and the eyes which are attached to the head. Disclaimer: I haven’t bought this costume, so I wouldn’t know exactly how tricky it is to cut those beaks and eyes off. But if you do manage to do that, then you can easily put an Octonauts hat on top of it. Also you would have to get rid of that red ribbon and put a blue collar instead. As I mentioned in the Kwazii cat costume, you can use an old shirt for the blue collar. Here’s a link on how to make a collar at home. And most important of all, don’t forget Peso’s medical kit!